Recently, Joshua Poteat has won awards from American Literary Review, Nebraska Review, Marlboro Review, Columbia, Bellingham Review, Yemassee, Lullwater Review, and Universities West Press. In 2001 he was the Summer Writer-in-Residence at the University of Arizona's Poetry Center and, in 2002, was awarded an Individual Artist's Grant from the Virginia Commission for the Arts. 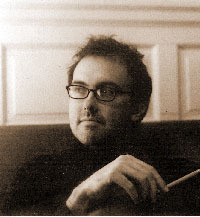 His book manuscript Ornithologies has been a finalist for the 2001 T.S. Eliot Prize for Poetry from Truman State University Press, the 2001 and 2002 Philip Levine Prize in Poetry from California State University-Fresno, and Copper Canyon Press' 2002 Hayden Carruth Award. Later this year, his work will be part of a national traveling exhibition entitled Pivot Points, featuring three generations of painters and poets, including Larry Levis, Dave Smith, Gregory Donovan, and others. Joshua lives in Richmond, Virginia, where he edits assorted texts, including art criticism in collaboration with the art historian Dr. Robert Hobbs.